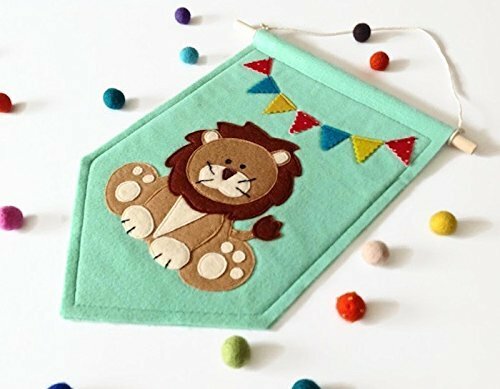 Lion Felt Banner, Nursery Wall Art, Eco Felt Pennant Flag, Kids Room Decor This handmade felt pennant banner featuring a cute lion and a cheerful bunting sewn onto a green background will brighten your little one's nursery, bedroom or playroom. It can also be a unique and thoughtful gift for baby showers, christenings and children's parties. The flag measures approx 20cm x 29cm (8" x 11) and is supported by a wooden dowel and a string attached for hanging on the wall. This banner flag is made with love and attention to detail using the best quality eco felt in a smoke-free home studio. I am happy to customise the background of this banner in a different colour to match your decor. This banner is for decoration only. It is not a toy, so please hang it safely out of reach of tiny fingers. For indoor use only. The felt balls in the pictures are not included in this listing. If you have any queries, feel free to convo me. If you have any questions about this product by MagiCuts, contact us by completing and submitting the form below. If you are looking for a specif part number, please include it with your message.